Professional advice and resources for nuisance opossum problems. Need opossum removal in your hometown? Click here for our 2012 nationwide list of hundreds of wildlife removal experts, serving all 50 states! Do It Yourself Tips for Keeping Opossums Away - Opossums are one of the most unmistakable animals in North America as they are the only marsupial that lives on the North American continent. While opossums were once native only to South America, they are now a common sight all throughout the Eastern and Southern states of the United States. Opossums are most easily recognizable by their snow white faces, brown/black body and long hairless pink tail. This tail is prehensile and you can often see the opossum carrying food with its tail or hanging from a tree with its tail. Opossums are considered an invasive species because they are not native to this land; however they are more commonly considered a nuisance by those who have opossums living nearby. Opossums are pests because they will do and break into almost anything to score their next meal. Once an opossum learns that you have good food at your house, you can be certain that it will return on a daily basis to cause havoc on your yard and house. Possums can make terrible messes in your yard when your trash cans are not secured. They will also make a meal of any vegetables or fruits that you have growing in your garden and will eat up all your pets’ food if it is left outside. Their droppings can contain parasites that your pets might eat. These critters will also set up their new home in your home by chewing through the exterior of your house to get into your walls, garage, shed, attic, etc. Once opossums have invaded your home, they can do considerable damage by chewing through wood and drywall, gnawing on electrical wiring and rep up all the insulation in your house. Opossums often will die inside your house creating a biohazard to you and your family. Try some of the do-it-yourself tips to keep away opossums. 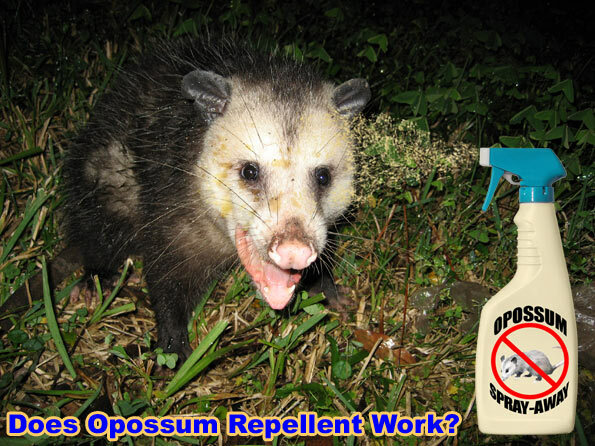 The easiest way to get rid of opossums is to prevent them from becoming a problem in the first place. Some ways that you can prevent opossums from being attracted to your house is to take away their food source. You can do this by making sure that your garbage cans are secured inside your garage or in air tight containers. Another thing that you should do is to make sure that your pets’ food is inside and pick up any fallen and rotting fruit or vegetables. Taking away an opossum’s food source is a sure way to get them to leave you alone. Perhaps one of the best ways to make sure that possums don’t invade your property is to build a fence either around your entire yard or just around your house or garden. You can go with the traditional picket fence or a wire mesh fence, but whatever you decide, make sure that you bury the fence at least a foot underground and have it extend a few feet above ground to ensure that the animal does not burrow under or jump over the fence. However, if you already have opossums on your property or in your house, these methods will only prevent new ones from coming in. There are a variety of ways to get opossums out of your house and yard. There are repellents available, but unfortunately repellents do not work very well whether they are aversion odors (like pepper) or predator scents (like coyote urine). There are also sound repellents that emit ultra sonic waves that are unpleasant to animals, but this is also not a sure thing. One repellent that does seem to work well is the motion activated sprinkler system. You can pick these up online or in a local garden store. You place them near the areas that you do not want them, like in your garden or near your porch that will activate every time they come in its reach. It will then spray them and they will learn not to go near that device unless they want to get sprayed. Trapping is another option that you can take, if it is legal in your area. You can get a cheap and effective trap at a hardware or pet store or rent one from the animal control office. Set the traps near the places that the opossums like to visit and bait them with fresh vegetables and fruits. Once you have caught the opossums, relocate them at least 10 miles away from your home. After you have done this, patch up all the holes that the animals are using to get into your home to ensure that they do not come back. Read more about opossum trapping here. Click for my opossum removal photo gallery. Visit my awesome opossum trapping blog! I personally feel that trapping and removal is the best way to keep possums away from your yard or house, but you can attempt these preventative measures first if you're in no rush to trap and remove.